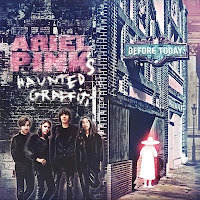 medium rotation ⟳: Daily Nugget #9: Ariel Pink's Haunted Graffiti, "Can't Hear My Eyes"
Daily Nugget #9: Ariel Pink's Haunted Graffiti, "Can't Hear My Eyes"
Some of my earliest memories of music were born in the back of a maroon 1968 Volkswagen bus. I can recall looking out the window at the dry Idaho landscape in the late 70s and early 80s, while soft adult contemporary pop gently streamed out of the tiny AM radio: "Africa", "Chariots Of Fire", "We Just Disagree", "Cool Night", "Sailing", "Making Love Out Of Nothing At All", "Forever In Blue Jeans", "I'm Not In Love"...the list goes on and on, and while my pesky inner critic has been conditioned to mock and dismiss such margarine glop, the fact of the matter is that these soft hits are burned into my cerebral cortex. They are my nursery rhymes; I have given up on even calling them guilty pleasures. Like hearing the Johnny Carson theme song and instinctively knowing it's bedtime, exposure to adult contemporary smooth jams circa '77-'83 lulls me into the back of my parents' VW like a hazy childhood daydream. Ariel Pink is particularly talented at channeling the soft warmth of 70s smooth pop, recreating not just the rolling melodies, but, more importantly, the fuzzy aural glow of a tiny AM transistor radio. The fact that much of his output has been recorded at home on cheap equipment is part of it, but conceptually, the fuzz is crucial to the aesthetic; listening to Air Supply at high volume on an expensive stereo is preposterous—it's not meant to overwhelm, but rather to seduce softly. When Ariel Pink signed to an actual record label (4AD—a good choice, given that label's fondness for mystic pop like the Cocteau Twins), I wondered whether he would go hi-fidelity on us. Luckily, he didn't. While the new record, Before Today (note the explanatory title), is the work of a band in (presumably) a studio, it remains a sharp collection of the soft sounds he does best. If you like the idea of a sincere geek doing karaoke to lost Journey ballads (I do), then twist your AM dial accordingly. bought the album. all of it is fab...it's the PERFECT thing to have in the background sitting on the lake with a glass of mediocre white wine...ice cube included. I am sold. Really enjoying your blog! You've made me go back and conciously listen to various things I've collected over the years. Hope you keep it up as i'll be be popping by here to see what nuggets you've unearthed.